I've been a story-teller my entire life. Either making up stories to amuse my classmates, or building them conceptually, or rarely taking the time to write them down. I got this gift primarily from my Mother, who would spin yarns to me and my friends when we were little. That spark led to an entire lifetime of story-telling. Even though it didn't lead me ultimately into a direction you might expect this story to go - young man pursues his dreams and despite many obstacles finds success as a writer - it did sorta go that way. Not all stories end the way you think they will. And often our path is formed in ways we don't expect. When I was around twelve years old, a voracious reader of all things interesting to me, I decided I would be a great writer someday. And so, like any intelligent young man, I set my sights on the big-time. Why muck around in the dirt when I could just skip right over all that and get published in a major magazine? I was certain they paid people for those stories. Why not me? So I sat down and wrote a short story called, "The Techno-Color God" which has (thankfully) been lost to the dust bin of time. Trust me when I say that I hold no illusions as to the quality of that story, the writing, or its merits in any shape or form. It sucked. To my twelve year old self, writing in my room on an actual Typewriter, it was gold. Surely it would knock the socks off the Editor and be picked up for publication. I remember the basic premise of the story revolved around the fact that the world used to actually be in shades of gray, almost like the movie Pleasantville years later. But much worse. 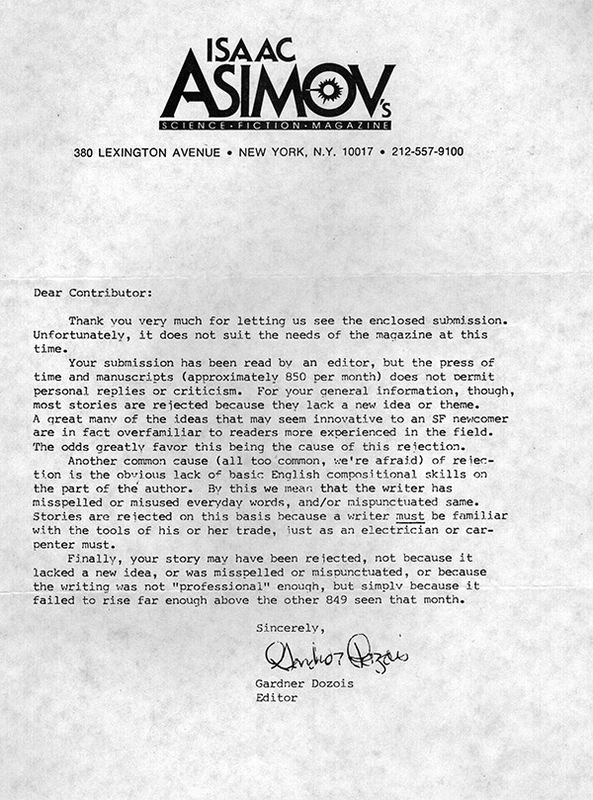 At least the Asimov Magazine's rejection letter was nice about it. In fact it helped me. 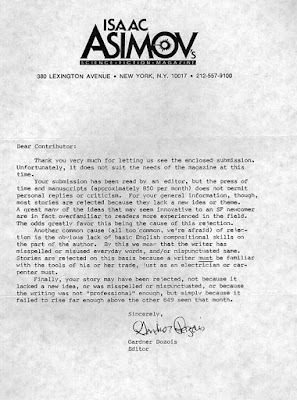 As did all the other rejection letters that came afterwards. I have a folder with hundreds of rejection letters in it. Not only those for writing, but including those for comic book submissions and eventually creative positions during the early years of my career. You can choose to take rejection many ways, and often it can seem depressing. But I've always chosen to see it more as a challenge. A personal challenge to do better, to find another way, to move on past rejection and find the path that is right for me. No, I didn't turn out to be the next great writer. Not yet. But story-telling and spinning yarns has been in my blood my entire life. It is present underneath everything I do. In the thousands of television commercials that I've written and produced. In the screenplays. In the short films. In this blog. In the branding development, the advertising, the presentations, the thousands upon thousands of pieces that I've created. And in every single piece of work. There is a story at the heart of them all. It is the connective tissue that binds everything I do. I mention all of this as encouragement. If you are out there right now along your own path, finding yourself blocked or rejected, I want to encourage you to take the long view. To find your own challenge. To gain strength from rejection. It isn't the universe's way of punishing you, it is the universe's way of pointing you in the right direction. A direction that only you, and you alone, can find for yourself. Today I am perfectly comfortable knowing that I am a professional writer. And so much more than that. I've been paid a lot of money over the years for things I have written and created. I hope someday to be paid even more for things I have yet to do. And while the dream of becoming the next Harlan Ellison, or Ray Bradbury may have eluded me so far - that doesn't mean I have to give it up. Dreams are what keep us going. The dreams of that twelve year old boy, writing crappy stories on a crappy typewriter, are still alive today. They will not die. Don't let your dreams die. Hold on to them. Work hard to achieve them. And always know that the path to realizing them is not always straight. It can often be rather strange. And wonderful. Heh, while reading the article I looked away, looked back and read the line 'Today I am perfect'. 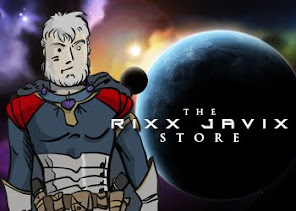 My immediate thought: That is so Rixx, always so humble, then I saw I just misread the line and I was really disappointed that you did not write that you are perfect. A great article that actually came at the right moment for me. Thanks for the perspective, I think I actually needed that! Excellent. I hope it helped you in some small way.